Looking to escape to a tropical paradise? Vacation Monty is ready to get the party started with you! 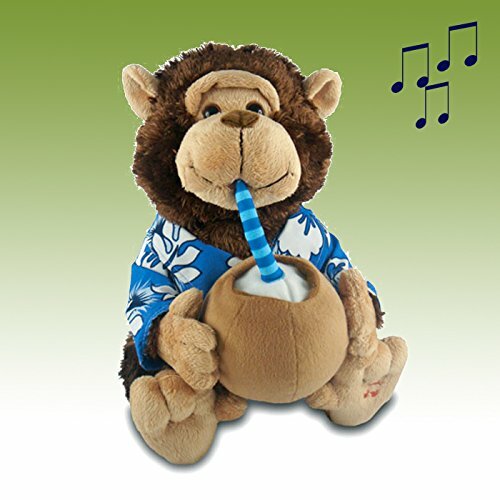 Vacation Monty is just one of the many charming musical animated toys we carry. The movements of this cool, Pina-Colada sipping ape are absolutely adorable. When you turn him on, Monty's cheeks begin moving in and out, looking as if he's really sucking down his cool coconut beverage. As he sways back and forth to the song "Escape" (the all-familiar Pina Colada song), his moves are so relaxing, you won't be able to help but to imagine yourself sipping a Pina Colada on a tropical beach right along with him. This adorable tropical monkey makes a unique novelty gift and an great gift reveal and memento when it comes to surprising someone with a trip to the islands. Going to a tropical-themed party? Take Vacation Monty along for some added fun or give him to the host or hostess as a gift. If you have any questions about this product by Center Gifts, contact us by completing and submitting the form below. If you are looking for a specif part number, please include it with your message.